Located along the Sassagoula River, Port Orleans is actually 1 large property, divided into 2 distinct sections. Port Orleans Riverside, designed to feel like Louisiana and the old south, with beautiful antebellum mansions and bayou buildings representing the sleepy towns along the Mississippi River. It is a gorgeous sprawling romantic resort. Port Orleans Riverside itself is divided into two sections. The Mansions section and Alligator Bayou. Port Orleans Riverside recently underwent a complete renovation of the entire resort. All of the guest rooms here now have either 2 queen beds or 1 king bed. Double sinks in the vanity area, new shower stalls and new furniture including flat panel TVs and mini refrigerators. Magnolia Bend resembles the grand manor homes of southern plantations with their grand staircases and stately white columns surrounded by azaleas and magnolias. 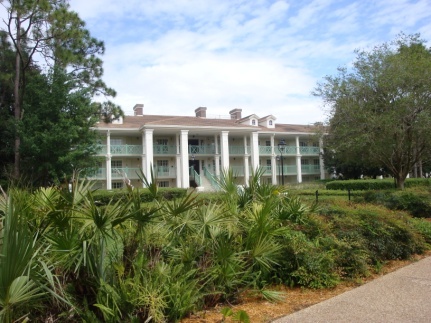 There are four three-story individually-styled mansion buildings; Acadian House, Magnolia Terrace, Oak Manor and Parterre Place. Each building consists of a central three-story structure and four two-story wings. The elevators are located in the central part of the three-story sections, next to the main entrance. As a MickeyTravels Disney travel specialist who also happens to live in central Florida, my clients often ask me to make recommendations regarding where they should stay while visiting Disney World. My answers vary; each client has unique needs and preferences, and each Disney Resort hotel has magical features to offer. For families with children or any guest looking for a fun-filled atmosphere, Disney’s Polynesian Resort is a wonderful hotel to consider. I’ve had many families stay at the Polynesian, and their feedback has been exceptionally positive. Families appreciate the convenient location of this hotel. One of three Disney hotels located on the monorail line, the Polynesian is a quick monorail ride away from the Magic Kingdom and two easy monorail rides away from Epcot. And kids love to watch the monorail go by almost as much as they love riding it! My clients have also told me that they enjoy the overall atmosphere of the Polynesian. From the tropical-themed rooms offering beautiful views, to the friendly cast members who greet guests with warm “Alohas,” to the white-sand lake beaches and lush vegetation, guests at the Polynesian feel as if they’ve been transported to a tropical paradise. 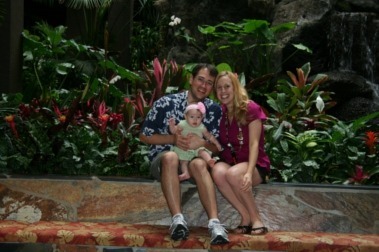 Here are two photographs of my family in the lobby at the Polynesian. It doesn’t get much prettier than this! On our recent trip to Walt Disney World we stayed at Disney’s Port Orleans French Quarter. This resort is by far my favorite moderate resort. Located along the Sassagoula River, Port Orleans is actually 1 large property, divided into 2 distinct sections. Port Orleans Riverside, designed to feel like Louisiana and the old south, with beautiful antebellum mansions and bayou buildings representing the sleepy towns along the Mississippi River. It is a gorgeous sprawling resort.